← Have the reefs off Kenya dodged a bullet? The rapid warming of the ocean waters is not allowing enough time for corals to naturally evolve tolerance as they possess a poor genetic ability to adapt to such stresses in their long lifetimes. A Satellite Bleaching Alert Level 2 (signifying widespread coral bleaching and mortality) was issued by NOAA for areas including the Galapagos Islands. However, recent observations by scientists suggest that the influence of large-scale thermal stress may have been overestimated. 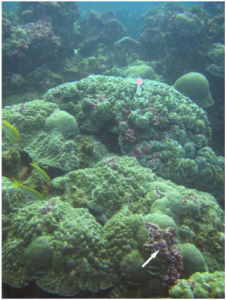 In the summer of 2012 a team of researchers surveyed the corals of 8 islands and recorded coral recovery as well as factors that were significant in making corals resilient to environmental disturbances. They found promising signs of recovery for the Galapagos reefs, a glimmer of hope in wake of our current situation, the third ever global coral bleaching event. Psammocora stellata. Galapagos Islands. Usual appearance of small colonies. Photograph: Paul Humann. These studies show that there is hope for the Galapagos coral reefs, despite the tremendous stresses they’ve been put through. Hopefully we can continue to watch as they defy odds and (very) slowly return to their former glory. 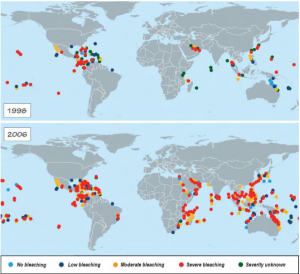 “How Global Warming Is Driving Mass Coral Bleaching.” Skeptical Science. N.p., 23 Sept. 2015. Web. <https://www.skepticalscience.com/coral-bleaching.htm>. Smith, Julian. 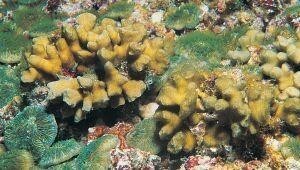 “Threatened Galapagos Coral May Predict the Future of Reefs Worldwide.” Mongabay Environmental News. N.p., 07 Nov. 2012. Web. 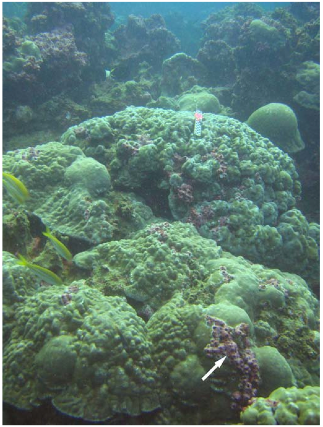 <http://news.mongabay.com/2012/11/threatened-galapagos-coral-may-predict-the-future-of-reefs-worldwide/>. Glynn, Peter W., et al. “Coral reef recovery in the Galápagos Islands: the northernmost islands (Darwin and Wenman).” Coral Reefs 34.2 (2015): 421-436. “2014-16 Bleaching Event Continues: June 2015 Update.” Coral Reef Watch. NOAA Satellite and Information Service, 2 June 2015. Web. <http://coralreefwatch.noaa.gov/satellite/analyses_guidance/global_bleaching_update_20150602.php>. Glynn, Peter W., et al. 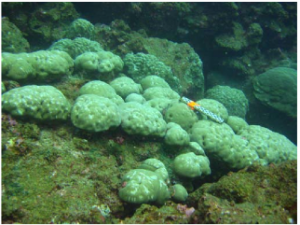 “Reef coral reproduction in the equatorial eastern Pacific: Costa Rica, Panamá, and the Galápagos Islands (Ecuador). VII. Siderastreidae, Psammocora stellata and Psammocora profundacella.” Marine biology 159.9 (2012): 1917-1932. This entry was posted in Uncategorized and tagged 2016, Angela, bleaching, coral, Ebio, Galapagos, islands, recovery, reef, Rice, survival. Bookmark the permalink.